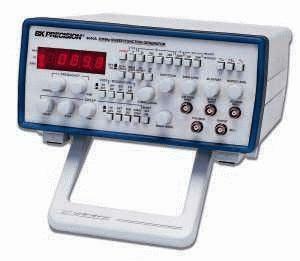 The 4040A Sweep/Function Generator with Frequency Counter generates sine, square, triangle, ±pulse, and ±ramp in the frequency range from 0.2Hz to 20MHz in 8 ranges. Output is read on a 5-digit LED readout. Output level is 20 v p-p open circuit, or 10 v p-p into 50 ohms. Has built-in frequency counter good to 30MHz. Also capable of Burst operation which can be sourced both internal and external. The burst is continuously variable from 5% to 90% of internal gating frequency. VCG input is 0 to 10 v.